Reports that Chinese vessels came close to a major Philippine holding in the disputed South China Sea this month have touched off a tough debate in Manila that could disrupt a fragile, year-old friendship between the two sides. A vessel from China planted a 3-meter-high flag on Sandy Cay, which lies in a Philippine-controlled area of the South China Sea’s Spratly Islands, during or before the third week of July, Congressman Gary Alejano said Facebook. Chinese naval and coast guard vessels passed near there Aug. 12, he added. Images collected by the Asian Maritime Transparency Initiative, under the U.S. think tank Center for Strategic and International Studies, show nine Chinese fishing ships and two naval or law enforcement vessels passing Aug. 13 near Thitu, a Spratly feature occupied by more than 100 Filipino civilians. “It might be a way of testing the Philippine government at the moment, probing for a response, what they can get away with and also to see how much pushback there would be in the Philippine system, but there’s been very little pushback” said Euan Graham, international security director with the Lowy Institute for International Policy in Sydney. “Operationally you could say the door is open to China if it wanted to go to the next stage,” he said. It could set up a “soft blockade” of the cay and eventually put structures on it, Graham said. Philippine President Rodrigo Duterte gestures during the 19th Founding Anniversary of the Volunteers Against Crime and Corruption at the Malacanang Presidential Palace in Manila, Philippines, Aug, 16, 2017. 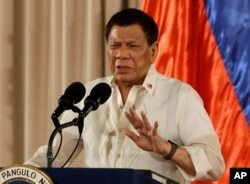 Philippine President Rodrigo Duterte said he saw no reason to defend Sandy Cay unless China invades it, domestic media said Tuesday. His foreign affairs head was quoted Tuesday saying China was not occupying the cay, which is within 22 kilometers of Thitu Island and often described as a sandbar, and that his department would give up no territory. But Antonio Carpio, a senior associate Supreme Court justice in the Philippines, has alleged a Chinese invasion. His comments have in part prompted the reactions from government officials. Duterte’s government and China shelved their maritime disputes last year, and China pledged $24 billion in aid and investment to the Philippines. Neither side agreed to stop its activities in the South China Sea. Beijing, the strongest claimant among six with interests in the South China Sea, hopes its upbeat Philippine ties show it can manage maritime disputes without third-party intervention, scholars say. In July 2016, a world arbitration court ruled at the request of the previous Philippine president that China’s vast claim to about 90 percent of the 3.5 million-square-kilometer sea is legally invalid. Beijing disregarded the ruling. Vietnam has clashed with China over the sea since the 1970s, as well. Since 2010, China has alarmed all claimants as well as Washington by stepping up land reclamation followed by military installations on some of the sea’s larger islets. Claimants prize the sea for oil, gas, fisheries and shipping lanes. “The Chinese are keen to maintain, for lack of a better word, that façade that things are getting better,” said Collin Koh, maritime security research fellow at Nanyang Technological University in Singapore. For now, analysts see Philippine politicians struggling to come up with a response that satisfies China-suspicious public sentiment while maintaining the friendship with Beijing. China may pull back for now and the Philippines might call the Chinese ambassador in for a discussion, said Eduardo Araral, associate professor at the National University of Singapore’s public policy school. It’s unclear whether any Chinese activity near Sandy Cay was organized by the central Chinese government or by a local bureaucrat, Araral said. China embarrassed Duterte last year by parking vessels on Benham Rise, a submerged plateau on the Pacific Ocean side of the Philippines, prompting the president to come back with vows of strengthening control over its 10 Spratly Island holdings. The flap that came to light in April did not affect overall Sino-Philippine relations. But lack of official resistance to Chinese activity at Sandy Cay could prompt China eventually to call the spot its own and restrict Philippine access, scholars say. A strong Philippine resistance of China’s maritime activities could prompt Beijing to hold back investment in the Philippines, Oh added. Duterte is looking to China and Japan to help fund railways and other new infrastructure through his six-year term. China could eventually place structures on Sandy Cay, Graham said. It has installed combat aircraft infrastructure on the larger Spratly Island features of Fiery Cross, Mischief Reef and Subi Reef, the U.S. think tank says.